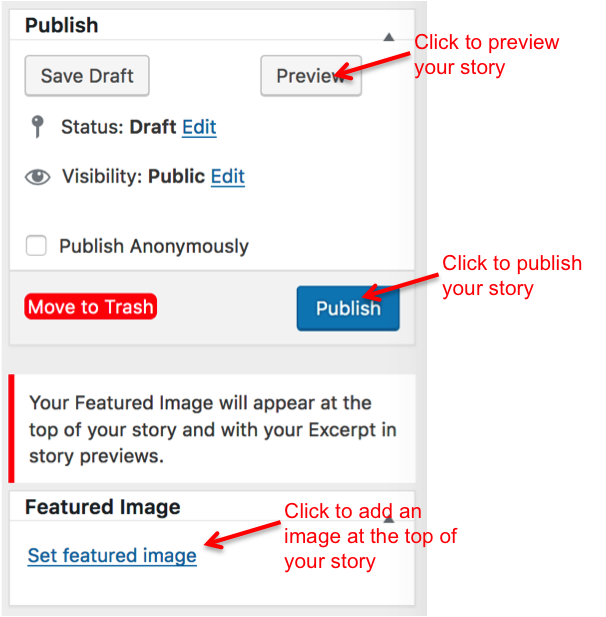 We’ve added a new option to make it easy to print or download the stories you’ve written. 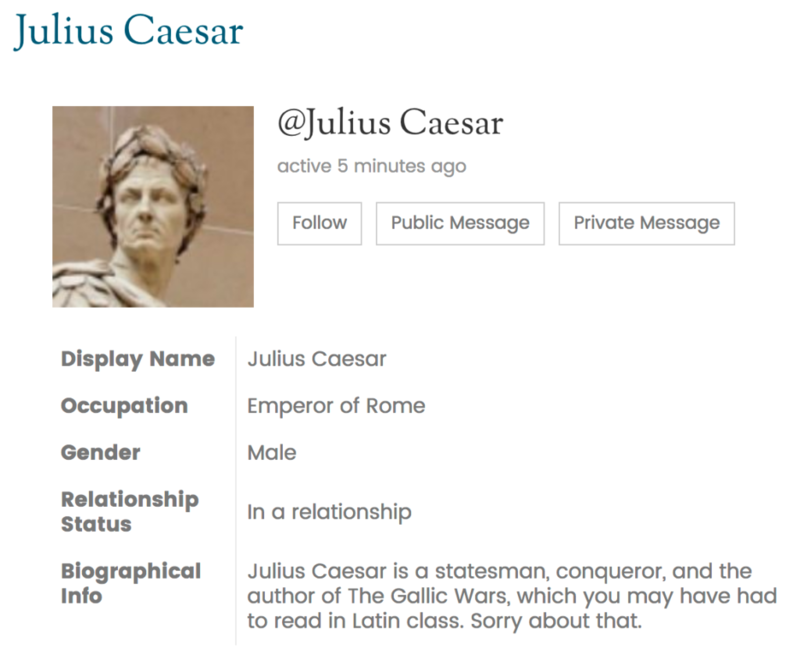 Sign into Retrospect, pull down the menu from your name at the top right, and click My Profile. 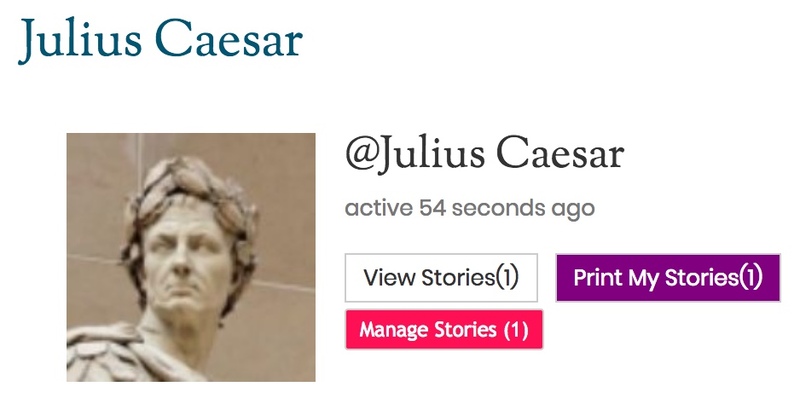 Along with your profile information and choices, you’ll see a purple button called Print My Stories. Click the button. Retrospect will compile up to ten of your stories into a web page. From your browser menu, select File > Print. To print your stories, click Print. If you have more than ten stories, scroll to the bottom and click Older Posts. Lather, rinse, and repeat as needed. If you save to PDF, you’ll need Adobe Acrobat Reader (or equivalent program) to view the file. It’s pretty simple, actually. Create an account. Read a few stories (from the Home page) to see what others are posting. Then, jump in and start writing! Our Home page highlights the latest prompt, along with stories that have already been written and shared. You’ll also find other stories from recent prompts and a list of upcoming prompts. The most important menu is at the top of the page. Here, you’ll find items such as Read Stories, Write Stories, My Stories, and Help. Dropdown menus will take you where you want to go. If you have questions, select Help from the top menu. You can also contact support, report issues, and send us suggestions by clicking Contact from the bottom menu, or by emailing us at support@myretrospect.com. 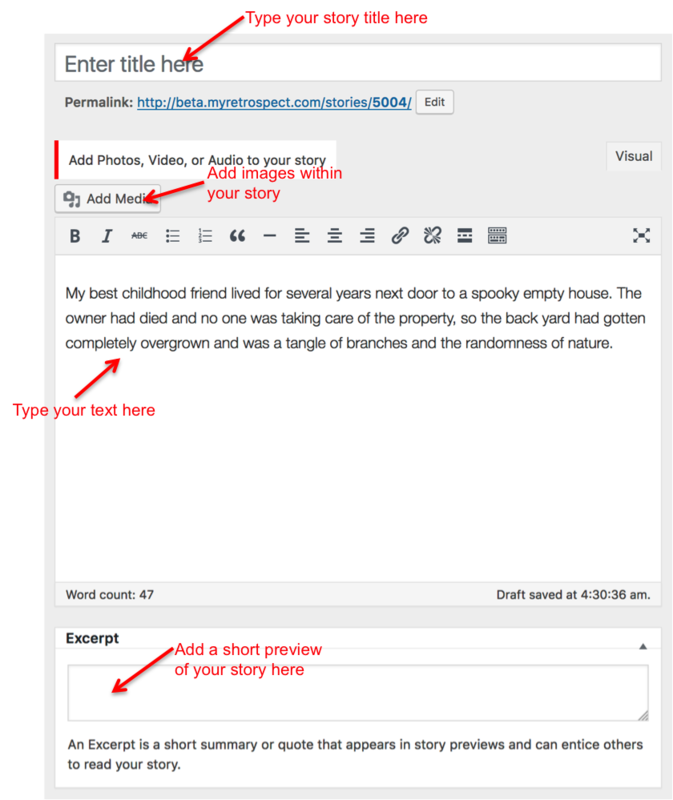 It’s easier if you write your first story in response to the current prompt—just click Start Writing on the Home page. If you’re stuck for an idea, pull down the Write Stories menu look at previous prompts, or write about your own topic. For your first story, try writing a Quick Take—just a paragraph or two, perhaps adding a photo from your archives or the Internet. (Feel free to post material you’ve written previously.) The interface is similar to a word processing program. 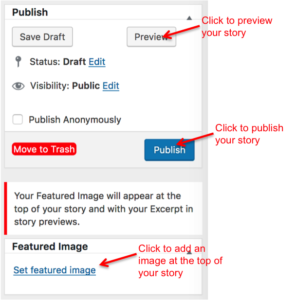 Once you’ve finished writing, use the Publish box to preview, save, and share your work. You can also add a Featured Image if you have one. Enjoy Retrospect and happy storytelling! You can find your profile under your name in the top right corner of the website. Here you can complete your user profile, change your password, read messages, and see writers you’re following or who are are following you. You can also specify email settings for how often you want to be contacted. If you’re curious about other Retrospect members after reading their stories, you can check their profile for biographical information they may have shared. To do so, click their name anywhere you see it on the site and, on the list of stories that appears, click the link at the top to view their profile. If you’d like to enter and share your own information, sign into Retrospect, pull down the menu from your name at the top right, and click My Profile. You’ll see your public information along with a set of tabs. Click Edit, fill in any fields you want to share, and click Save Changes when you’re done. You can also add or change your profile photo. Your bio and your photo, if you have them, will appear at the bottom of all of your stories. Elsewhere in your profile, you can change your email settings (which notifications you receive from Retrospect and how often), check your messages, and manage the lists of members you follow and who follow you. We have the honor of hosting several published authors on Retrospect. We want to make it easy for you to explore these authors’ stories in greater detail. So we have teamed with Amazon to offer access to their books from Retrospect. On each author’s story page you’ll see a link to their books on Amazon. By clicking through, you can support their work by ordering their published books. Your order, including anything else you buy in the same session, will also help support Retrospect.